Vinsight can enable sales staff and management to track interactions with their customers, review their order patterns and keep up to date with their issues and concerns. Essentially some great Customer Relationship Management (CRM) features. The main place to access this information is on the Contacts page. This feature is available on our ‘multi-location’ subscription. When you ‘view’ a contact from the Contacts list, you will see four tabs, ‘Contact Detail’, ‘Contact Activity’, ‘Order History’ and ‘Stock Allocation’. The ‘Contact Detail’ contains the name, contact details, default payment terms etc for a customer and is explained in more detail on our Contacts page. The ‘Contact Activity‘, ‘Order History‘ and ‘Stock Allocation‘ tabs are reviewed in more detail here. Everytime you have contact with a customer, e.g. a phonecall, an email, visit, or conversation, simply select that customer from your Contacts list and log the event on their ‘Contact Activity’ page. This will create a detailed history of interactions with a particular customer. This record will assist sales staff to track and manage their own activities and customer interactions as well as providing management with a great way to track and review what their sales staff have been up to. Clicking on the ‘Order History’ tab will bring up a record of all historical sales and purchase orders relating to that particular customer. 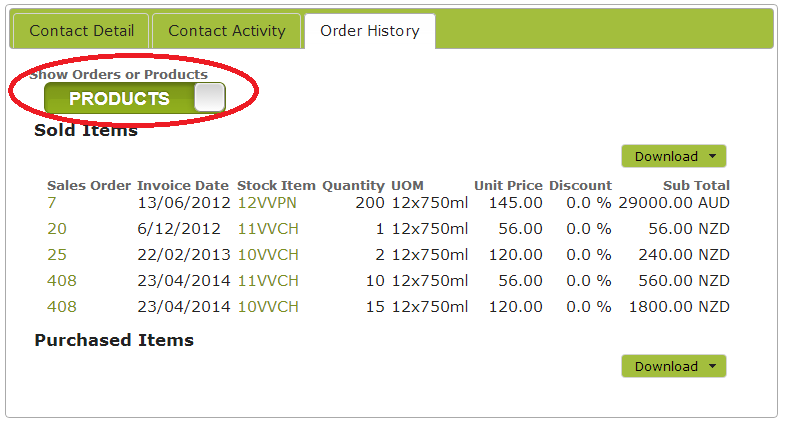 Clicking on the ‘Show Orders or Products’ button to switch from sales orders to product information. You may have limited availability products that you want to ensure certain customers have access to. You can do this by putting aside an allocation for them that they can draw down as they order. 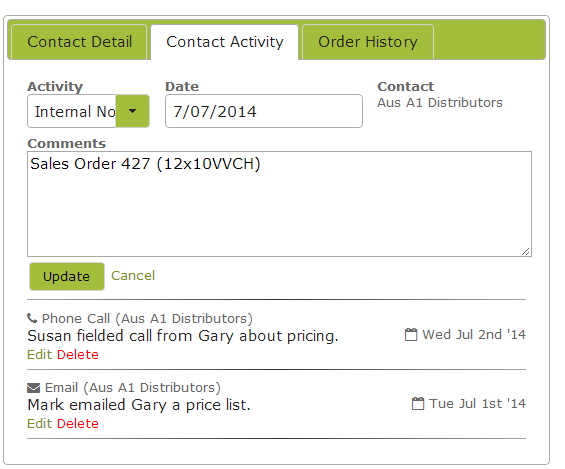 You can manage allocations specific to this customer in the ‘Stock Allocation’ tab. Details on how to do this are set out in our Stock Allocations page. The customer’s allocation will reduce automatically as the tracked product is ordered and despatched to it. 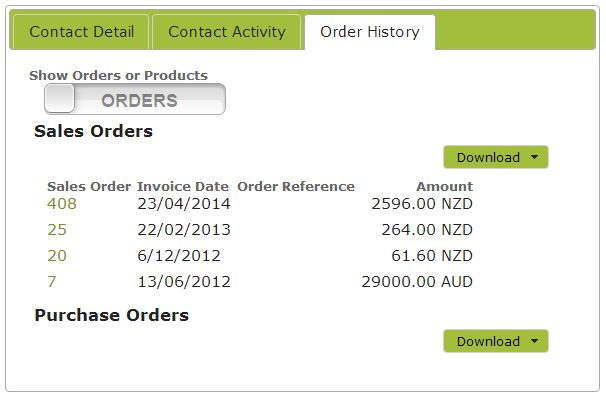 The allocations can also be copied to a new customer by selecting the stock items in question and clicking ‘copy’. This could be useful to save time if you have a new customer that is quite similar to an existing one and wish to generate a starting allocation that you can then fine-tune. For more information see Stock Allocations.